Until De Beers successfully marketed them back in the 1930s and 40s, diamonds weren’t really that big a deal. Before then, ostentatious wealth and prestige was all about gold, silver and coloured gemstones. And rubies were front and center. There’s a lot to be said about rubies, but rather than wax lyrical, let’s chunk it down into bite-sized pieces for you. Ironically, one of the world’s most famous rubies – the Black Prince’s Ruby, set at the front of the Imperial State Crown of England – is, in fact, a spinel. 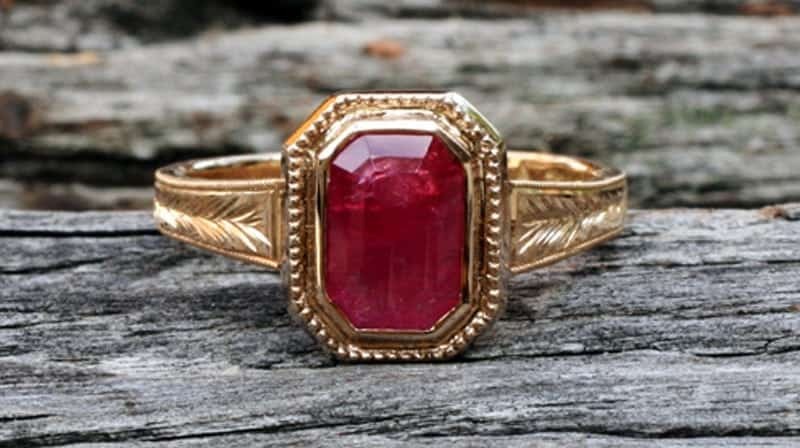 There are many more mentions of rubies in history and various folk lore and mythology, but you probably get the idea. Rubies were (and still are) a big deal. In fact, fine rubies are, by weight, some of the most expensive gemstones you can buy! It has a hardness of 9.0 on Moh’s Scale, making it quite suitable for use in jewellery worn day to day. Jewellery-quality rubies have been found in Afghanistan, Myanmar (formerly Burma – producing the famed ‘pigeon blood’ ruby), Cambodia, Pakistan, Sri Lanka, Madagascar, Namibia, Tanzania, Malawi, Kenya, Thailand and Vietnam. Small quantities of rubies can be found in the USA and Australia. More recently, Greenland has started commercial production. Inclusions are normal and vary with point of origin. Apart from the most common rutile (needle form), you can also find calcite, sphene, zircon, pyrite, biotite mica, almandine, apatite and boehmite..
Ruby was the first gemstone to have been synthesised in a laboratory, most famously in the late 1800s by Auguste Verneuil. The Verneuil Process (or Flame Fusion Process). This is the least expensive, fastest and most common method of production. Other methods include Flux Growth and Crystal Pulling, both of which are much slower and more capital intensive. These processes produce much higher quality (and more expensive) synthetic gems. Synthetics are relatively easy to identify, having relatively few inclusions. Virtually none feature rutile (the most common inclusion in natural ruby). It is important to consider the ecological impact and social ethics in the mining and distribution of natural rubies. Corruption, conflict, criminal activity, habitat destruction and human rights abuses are all (unfortunately) common in gem-producing developing nations. That is not to say that within these regions there is not good work being done. Organisations like PACT are working within mining communities. It’s crucial to develop strong relationships with a transparent supply chain to ensure that as much as possible is known about the origin, the energy and other costs of the gemstones that will be used in jewellery. Especially when that jewellery is meant to reflect a loving relationship. 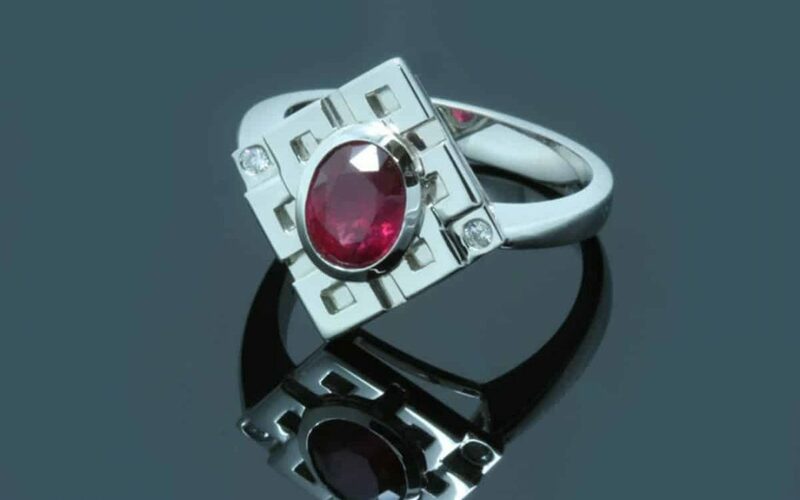 At Ethical Jewellery Australia, we are extremely cautious in our choice of supplier when it comes to rubies. 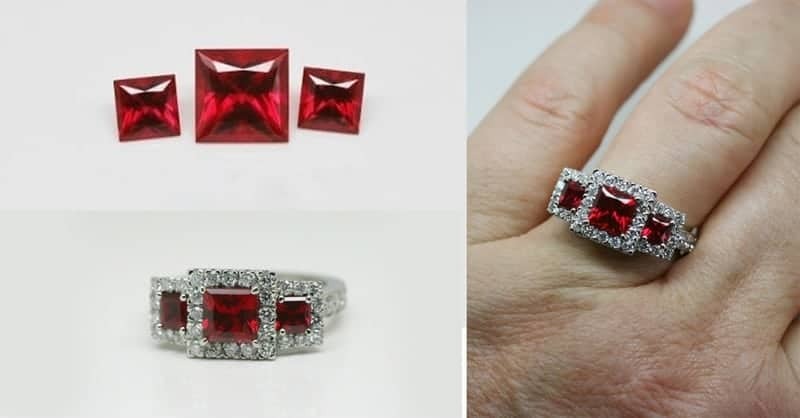 When we do source rubies for our customers we offer only fair trade, recycled (vintage) or high quality lab-grown. This does limit our options from time to time, but it’s not something we can (or will) compromise on. If you’d like to chat with us about having your special piece of jewellery (ruby encrusted or not) handmade by us, feel free to get in touch by email or phone. You can also check out our other work in our gallery or on Instagram and Facebook. Customers are taken through the whole process from design to sourcing and finally to manufacturing. Likewise, we only every use ethically sourced diamonds and gemstones. You can choose from Argyle, recycled, vintage and lab grown diamonds, Australian, US, Fair Trade, recycled and lab grown coloured gemstones.